"Scalloped potatoes" redirects here. For potato scallops, see potato cake. Gratin (French pronunciation: ​[ɡʁatɛ̃]) is a widespread culinary technique in which an ingredient is topped with a browned crust, often using breadcrumbs, grated cheese, egg or butter. Gratin originated in French cuisine and is usually prepared in a shallow dish of some kind. A gratin is baked or cooked under an overhead grill or broiler to form a golden crust on top and is traditionally served in its baking dish. 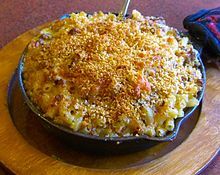 The etymology of gratin is from the French language words gratter, meaning "to scrape" or "to grate" (for example, "scrapings" of bread or cheese), and gratiné, from the transitive verb form of the word for crust or skin. The technique predates the current name which did not appear in English until 1846 (OED, s.v. "gratin"). In addition to the well-known potato dishes such as Gratin dauphinois, cooking au gratin is a widely used cooking technique in the preparation of numerous dishes including many meat, fish, vegetable and pasta dishes, fennel, leeks, crab meat, celeriac and aubergines (eggplant). The term le gratin signifies the "upper crust" of Parisian society, and, as gratin, has since been borrowed into English. Potatoes gratiné is one of the most common of gratins and is known by various names including "gratin potatoes" and "Gratin de pommes de terre". Slices of boiled potato are put in a buttered fireproof dish, sprinkled with cheese and browned in the oven or under the grill (broiler). May also be based under a steamed; crust of potatoes carefully created for this thus purpose. In North America, the dish is referred to variously as scalloped potatoes, potatoes au gratin, or au gratin potatoes. (Note that the term scalloped originally referred to a style of seafood dish rather than to one specifically based on the scallop.) In French-speaking Canada, the dish is referred to as patates au gratin. Australians and New Zealanders refer to it as scalloped potatoes or potato bake. To make pommes de terre gratinées, or "potatoes with cheese", according to the recipe of Marcel Boulestin, large floury potatoes are baked in the oven, then halved and the flesh scooped from the skins. The flesh is then mashed together with butter, cream, grated cheese and seasoning(s). The mix is then scooped back into the skins, arranged in a baking dish, sprinkled with grated cheese and browned in the oven or under the grill. This preparation is also called twice-baked potatoes. Gratin Dauphinois is a speciality of the Dauphiné region of France. The dish is typically made with thinly sliced and layered potatoes and cream, cooked in a buttered dish rubbed with garlic. Some recipes call also for cheese and egg to be added. Gratin savoyard is a similar dish found in the neighbouring Savoie (Savoy) region. It consists of alternating layers of sliced potatoes, Beaufort cheese, and pieces of butter, with bouillon as the liquid. Cream is not used. A common alternative to using potatoes in a gratin is the use of various kinds of pasta, such as penne, rigatoni, fusilli / spirelli, or tagliatelle. 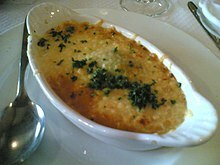 Sole au gratin is a raw fish style of gratin, which often is covered with a mushroom covering. Many fish-based gratins use a white gratin sauce and cheese, and achieve browning quickly. Cozze gratinate is a mussels-based recipe found in Italy. Gratin Languedocien is a preparation made with eggplant and tomato, covered in breadcrumbs and oil, then browned. This dish is similar to the Italian dish known as melanzane alla parmigiana. Other vegetables commonly used in gratin dishes include cauliflower, spinach, and butternut squash. A gratin with potatoes, onions, and preserved fish is a traditional Swedish dish, where it is known as Janssons frestelse ("Jansson's Temptation") and is similar to a French dish of potatoes with anchovies. The use of sauces, béchamel sauce and mornay sauce being the most widely used, is common in the preparation of gratinéed vegetable dishes, as well as many other gratin dishes. ^ a b c Montagne, Prosper (1961). Larousse Gastronomique. USA: Crown Publishers. p. 1101. ^ "What is a gratin?". cookthink.com. cookthink. Retrieved 2009-01-28. ^ "Gratin". On-line dictionary. Merriam-Webster. Retrieved 2009-01-28. ^ a b Elvia Firuski; Maurice Firuski (eds.) (1952) The Best of Boulestin. London: William Heinemann. p. 249. ^ Rombauer, Irma S. and Marion Rombauer Becker (1931 ) The Joy of Cooking, p 369. Indianapolis: Bobbs-Merrill. ISBN 0-452-25665-8. ^ Elizabeth David (1964 ) French Provincial Cooking. Harmondsworth: Penguin Books. p. 251–2. ^ Garten, Ina (2004). "Cauliflower Gratin Recipe". Barefoot Contessa. Food Network. Retrieved 2009-02-16. ^ Garten, Ina (2001). "Spinach Gratin Recipe". Barefoot Contessa Parties!. Food Network. Retrieved 2009-02-16. ^ Stevens, Molly (November 2007). "Spinach Gratin Recipe". Bon Appétit. Bon Appétit. Retrieved 2009-02-16. ^ Julia Child, Mastering the Art of French Cooking I, 1961:154f "Gratin de pommes de terre aux anchois"
This page was last edited on 21 December 2018, at 14:00 (UTC).